of its touchscreen to simulate the feel of buttons or keys, we just weren’t sure how Nokia would pull that off. Now we have a better idea, as Nokia’s recent patent filing for the Haptikos gives away some juicy details. The secret behind the device’s feedback is a “plurality of closely spaced voltage controllable protuberances,” or in other words, several small fluid filled compartments just under the screen’s surface. Under them are several piezoelectric members that can be controlled independently; when they extend upward, they apply pressure to the fluid compartments, raising the surface of the screen in that area. Nokia has yet to work out all the kinks, but you can see the parts that do work by downloading the Haptikos patent application (PDF file). Engadget recently posted a story about a flexible tactile display that can be wrapped around any part of the body and give haptic feedback to the user. 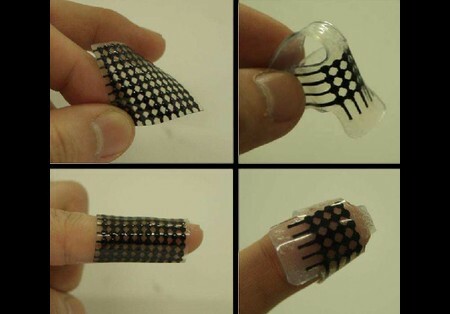 The research team from Korea’s Sungkyunkwan University that developed the device are focusing on applications like Braille for the visually impaired or transmitting tactile data to a remote user, but this is just the beginning; the applications for wearable haptic feedback are wide open.